With yet another renewable energy (RE) project completed on time and on budget, one has to wonder why the Departments of Energy (DoE) and Public Enterprises (DPE) tolerate Eskom’s continued refusal to sign additional power producer agreements. This especially since the latest REIPPP energy price bids that Eskom refuse to sign are so much lower than the first ones. Abengoa, a Spanish renewable energy company, recently announced the completion of its latest concentrated solar power (CSP) plant, Xina Solar One (Xina). According to a representative from the company, the project supplies clean electricity to 95 000 South African households. By means of Xina and two other plants the company built earlier, Kaxu Solar One and Khi Solar One, the company provides electricity to almost a million people in the Northern Cape, especially during the early evening peak, when this power is needed most. Fig. 1: Abengoa’s Xina Solar One CSP plant. These three projects are said to have created 1300 jobs during the construction phase, and now provide 80 permanent jobs during the operation and maintenance phase which will last for the next 25 years. Significant local content, which also created jobs and brought economic benefit to the province, is said to be worth around R2,8-billion. It is understood that the renewable energy independent power producers procurement (REIPPP) programme as a whole has created approximately 15 000 jobs. This excludes the hundreds of indirect support jobs in industries such as logistics, accommodation, catering, construction material suppliers, warehousing and support services which were created throughout the development and construction of these projects. 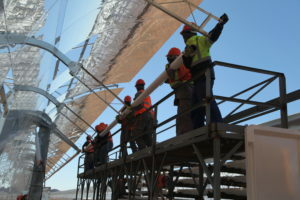 The skills development that the project, and others like it, brought to the Northern Cape was significant: specialist pipe welders and structure welders, pipe fitters, electricians, engineers, technicians, construction workers, and operators were needed to construct these complex, technical projects. Several of these types of skills could not be sourced locally at the start of these projects – for example, there were no welders. The first round of renewable energy projects developed these skills in the province. Today, there is a skilled pool of welders available for future projects or in other industries. Fig. 2: Assembling the solar collector. Clean energy development under the REIPPP programme has become integrally linked with socio-economic benefits for the communities near to where they are built. Not only is more than enough clean energy provided by these projects to support the entire province, but the whole community has benefitted as well. The Xina project, as well as all the other IPP projects, are required to contribute 1,1% of the project’s capital expenditure on socio-economic development and enterprise development for the benefit of the communities who live within a 50 km radius of the project. Abengoa, for example, invested these funds in projects which were designed to meet the most pressing local needs, such as education, healthcare, social support, as well as small business and entrepreneur development. Fig. 3: Typical new school. Many renewable energy companies have developed programmes which offer bursaries, internships, the funding of additional teachers at local schools, the construction of additional classrooms, general renovations of schools, etc. Social support included soup kitchens, food gardens, as well as other social programmes such as new housing developments, new medical and office equipment for a local clinic, and the building of an irrigation channel in Onseepkans. Renewable energy projects were built partly in response to the load-shedding and frequent power outages the country experienced from 2008, and have effectively given Eskom the time and space it needed to conduct the required maintenance on many of its coal-fired power stations, thereby supporting the utility and the national grid at a time of crisis. Concurrent with the country’s energy crisis, which was caused by the government’s failure to build additional generating plant early enough to meet growing demand and Eskom’s late completion of the Medupi and Kusile power projects, South Africa is experiencing the worst drought on record since 1933. South Africa is regarded as a water scarce region, and as the water crisis intensifies, it is imperative to pursue generation options which do not require the large amounts of water that coal-fired power stations do. In Western Australia, for example, which is perceived as climatically similar to the Western Cape, the so-called “millennium drought” of the early 2000s caused policymakers to implement a fleet of desalination projects, which now supply a significant portion of the region’s water supply. Similar water shortages in the Middle East and North Africa have resulted in these countries also successfully pursuing desalination. 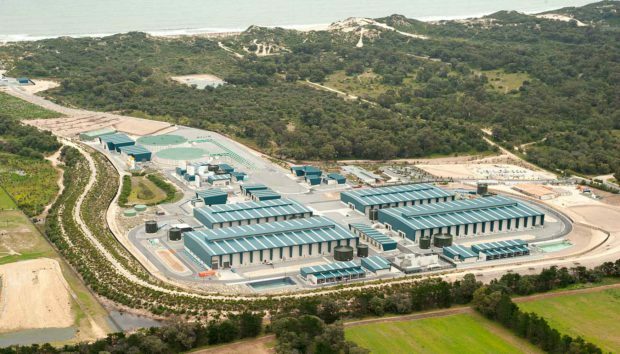 Desalination requires a significant amount of electrical energy. If that electricity can be provided by the sun and the wind, the country would literally have clean water from clean energy sources. 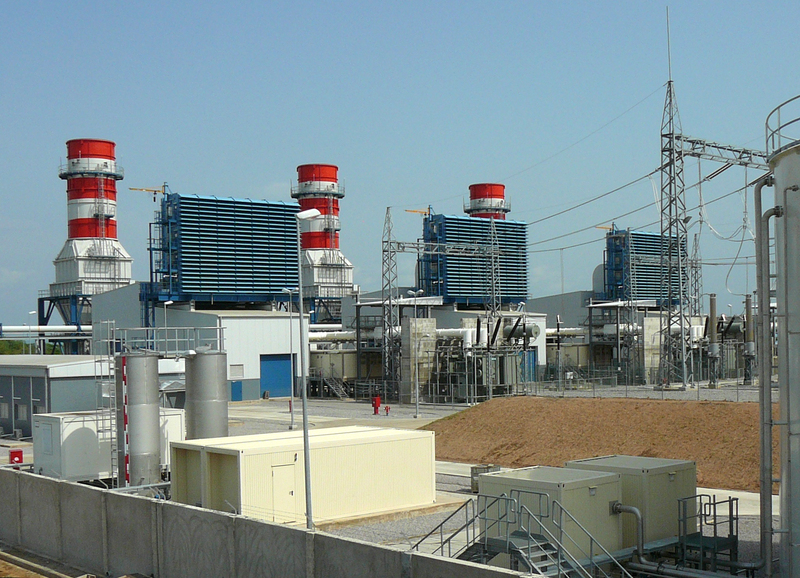 Furthermore, these electricity generation plants can be built more quickly, more efficiently and less expensively than coal-fired or nuclear-powered generation, providing clean, desalinated potable water without producing dangerous emissions or any kind, or any spent fuel waste streams such as coal ash or high-level nuclear waste. South Africa is considering a gas-to-power programme to support a solar and wind fleet to address the variability of wind and solar power, by supplying power when the wind doesn’t blow or the sun doesn’t shine. Gas-to-power plants can be ramped up or down very quickly to meet any differences in electricity demand and supply resulting from the variable output of wind and solar power generation plant. Although natural gas is a fossil fuel, it burns without emitting particulates and produces lower levels of harmful gases than the burning of coal. It would also ensure that these companies participate in a framework which encourages economic empowerment for previously disadvantaged people (BEE-programme), and spend their socio-economic development (SED) levies on impoverished communities, thereby bringing positive change as a by-product of providing clean energy and water services. 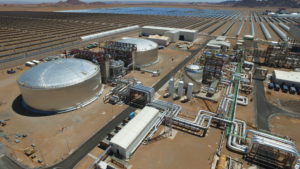 Interestingly, the Xina Solar One plant uses CSP technology, which is the only widespread renewable energy technology to include an integrated storage system, in this case, by heating and storing molten salt in tanks. This makes the technology more expensive, but enables the CSP plant to continue generating electricity during days of intermittent sunshine, and for six hours after sunset in order to contribute to meeting the evening demand peak. In future, it is expected that energy storage technologies like molten salt, Li-ion batteries and others will become more common. The REIPPP programme is a real asset to the country. Additional electricity has been generated to meet urgent demand, without emitting harmful gases into the atmosphere. Much-needed skills have been transferred and new jobs created, while social projects have benefited the communities who live in the rural areas where these renewable energy power plants have been erected. Eskom says it won’t sign new power producer agreements (PPAs) because the cost of electricity from independent power producers (IPPs) is too high. However, if the power utility was to sign the newer PPAs, which offer more electricity at lower tariffs, it would benefit from a blended cost which would significantly reduce the overall cost of electricity. The country has paid its “school fees”, benefitted from the more expensive first bid round of the REIPPP programme, kick-started a new renewable energy sector, and accepted bids for further rounds. But by stubbornly refusing to sign, Eskom is placing a stumbling block in extending the benefits in South Africa as well as to other neighboring regions. Furthermore, the fact that IPP-operated power stations were built using investor-sourced money rather than government funds, and have drawn foreign investment by local and international companies to South Africa, should be sufficient cause for the government to overrule Eskom’s refusal, and force the utility to sign additional power producer agreements without delay.